Marie Myrka Amazan, the cross-site coordinator of continuing education for all PIH/ZL nurses, is based in Hinche and provides training "on anything that the nurses need." 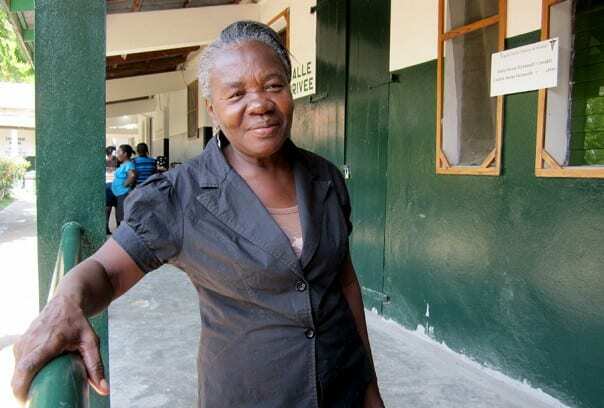 Marie Myrka Amazan, 66, is the cross-site coordinator of continuing education for all nurses in the health clinics and hospitals supported by Zanmi Lasante, Partners In Health’s sister organization, in the Central Plateau and lower Artibonite regions of Haiti. She has worked with ZL since 2000, contributing to the growth of services across central Haiti. I’ve been a nurse for 35 years, so my career is a long story. I started in 1971 as a school teacher in Les Cayes, a seaside town on Haiti’s southern peninsula. In 1977, after six years of teaching, I left that job and started nursing school. What made me decide to become a nurse was a nursing school graduation I attended. What really touched me was a song that a choir of nurses was singing. I knew I wanted to sing in that choir. I loved the words and what they were singing about. I immediately joined, and it was while I was in the choir singing that I realized I wanted to be a nurse. To this day, this music has stayed with me. Every time I sing these words, I cry. The song says that the compassionate Virgin Mary is here, as nurses are, to help assuage suffering. I got my nursing diploma in 1980, and I became a teacher in the same nursing school. After that, I moved to Port-au-Prince and worked in a private hospital as an on-call overnight nurse. That same year, I went to work in an orphanage, where I was in charge of the health of the children as well as staffing, supplies—everything. I also worked for an organization that did mobile clinics, including family planning and vaccinations. In 1983, I became a professor at the National School of Auxiliary Nurses. Later, I worked for the National School of Nursing, which collapsed in the earthquake in 2010. I worked for 11 years in that nursing school. At the same time I was working as a professor, I worked as a night supervisor in a public clinic in Cité Soleil, an impoverished area of Port-au-Prince. I spent 11 years there. During that time, Jean-Claude Duvalier left the country, and there were three years of intense instability until Jean-Bertrand Aristide was elected. He was ousted by his generals in 1991 and came back to power in 1994. It was very difficult. There were always problems within Cité Soleil, and it was hard to even get to the clinic. There were thefts and confrontations between different groups, and bystanders often suffered from these. I didn’t wear my uniform on my way to work because I didn’t want to draw attention to where I was going and what I was doing. I worked in Cité Soleil not because it was challenging, but because I wanted to improve my skills as a nurse through experience in a hospital. I got a ton of experience there, because I had to supervise all the clinical services, including pediatrics, maternity, surgery, internal medicine, and emergency. I had to work wherever there was a need. It was a wonderful experience for me for 11 years. I believe in professional development for nurses. Nurses who have good experience and training can save lives and help people. If they don’t, they can’t provide services that people need. I always tell the nurses I train to enrich themselves with experience and practice. In 2000, I joined Zanmi Lasante, working for four years as the chief nursing officer in Cange. Cange was much smaller then, with just one building as the whole hospital. Cange has just grown and evolved so much. In that time, as our program to treat HIV was expanding, we received a lot of visitors and foreigners on volunteer trips. The hospital wasn’t big, but there was a lot of activities, a lot of visitors, and a lot of excitement about the hospital—both in Haiti and internationally. During this time, I organized a training for a group of auxiliary nurses who worked in Cange, to train them and then equip them to train others. After that, ZL decided that we needed to open a training center. It was in this period that we were thinking about training and how important it was. The critical piece of the training center was that it was integrated from the beginning with the Haitian Ministry of Health. Before, Cange had been always its own private facility, not integrated with the public system. At that time, we were getting a lot of money for HIV treatment from the Global Fund to Fight AIDS, Tuberculosis, and Malaria and the President’s Emergency Plan for AIDS Relief. We were thinking about expanding to other sites and being asked by the Ministry to expand. We also wanted to expand our training platform through the Ministry of Health. So we rented a site across from the Catholic Church in Hinche, and I led a team along with all the doctors who are now the executive leaders of Zanmi Lasante. So I coordinated all of the training both in Cange and in Hinche. When we started, the training was all about HIV. Health care professionals—lab techs, pharmacists, nurses, and doctors—were coming from all over the country to learn to treat HIV, because across Haiti there was a push to treat HIV with funding from the Global Fund and PEPFAR. We also did a training on infection control for people who were hospitalized in the Hinche hospital. Eventually, I took on the role of coordinating all continuing education for nurses. We provide training on anything that the nurses need. We identify the needs through visits to all the clinics and hospitals and meeting with the nurses there. Then I plan the trainings to meet their needs. Since I’ve worked here, I’ve emphasized to the nurses I train that they should advocate for patients and design a plan of care. It’s empowering for the nurses to feel like they could create a plan of care, follow it, and provide a better quality of care because they’re advocating for patients. Nurses advocate for them when they’re facing a long wait and encourage them to ask questions. Patients might not tell the doctors everything that’s wrong with them, and that’s why it’s important for nurses to be there, so they can advocate. I tell the nurses this, because it matters to patients’ health. The patient sees the doctor as someone who gives the treatment and sees the nurse as someone who is much closer, like a friend or a family member to whom patients can really describe how they feel. There’s a lot more distance between doctors and patients. Nurses can always figure out more of what’s wrong with the patients because the patients talk to them. As you can see, I’m getting older, and eventually I’ll have to leave. So I would hope that I could serve as an example or a model for younger people. As for Zanmi Lasante, I hope that it’s never extinguished. To support the work being done by Marie Myrka Amazan and Zanmi Lasante, please click here.